Potter Family Eye Care | We treat your eyes like family. 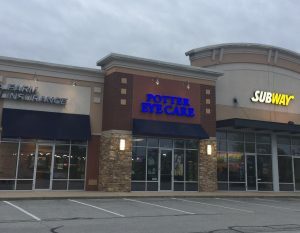 Welcome to Potter Family Eye Care! Dr. Austin Potter has been providing high quality eye care to the Hancock County community since 2005. Potter Family Eye Care helps families through the different stages of life from providing a child’s first exam, to improving a teens’ self-image with contact lenses, to helping adults in their 40′s with their vision changes to provide a solution that doesn’t hinder their lifestyle. Dr. Potter strives to build relationships that help individuals find solutions when vision changes throughout one’s life. Potter Family Eye Care understands that trust and good care establishes the rapport needed when more serious medical issues arise such as cataracts, diabetes, macular degeneration and glaucoma. Each person and family provides new challenges and Dr. Potter enjoys taking the time to work with his patients to make sure they receive the best care possible. Call 317-747-9263 to make an appointment or stop by and look through our great selection of boutique eyewear.